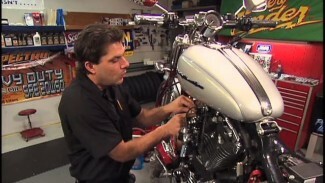 Harley fuel tank install has become easier over the years. On this 6 gallon Ultra tank, there are no fuel line clamps to deal with; nor is there a fuel line crossover. However, you still need to plan ahead, take your time, and work clean. And, as always, try to utilize a second set of hands whenever possible. Lower the Harley fuel tank down over the backbone of the frame. Install the two forward and two rear mounting bolts. Snug them, then torque to 15 – 20 foot lbs. Install your dash, along with vent & overflow lines. Also, plug in your harness. *Note: sometimes the dash seal will roll, or twist as you lower the dash down over the filler neck of the tank. It is helpful to spray this seal with glass cleaner for ease of assembly. Finish up by installing the black, plastic trim piece behind the tank, then snuggling and torquing the dash hardware. Front bolt 20-30 inch lbs. Rear bolt 36-60 inch lbs. *Be extra careful when installing the front dash bolt. It is small and on a slight angle. Be sure to start this small allen by hand. If you cross thread this bolt, you will actually be stripping/damaging the fuel tank itself. This bolt threads directly into a tab on the fuel tank. Plug in your fuel feed line and wipe up your fingerprints. 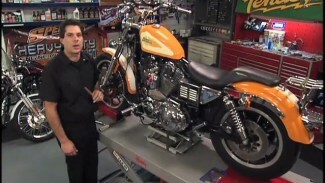 Harley fuel tank installation on your Ultra is complete. There are a number of reasons you will need remove your fuel tank. 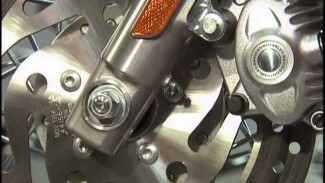 Your fuel tank may need to be removed a number of times throughout the ownership of your bike. Take your time, work clean, plan ahead. You should always have a perfect outcome upon completion of this job. Onto the new exhaust install.